← Out in the Park: a celebration of love! 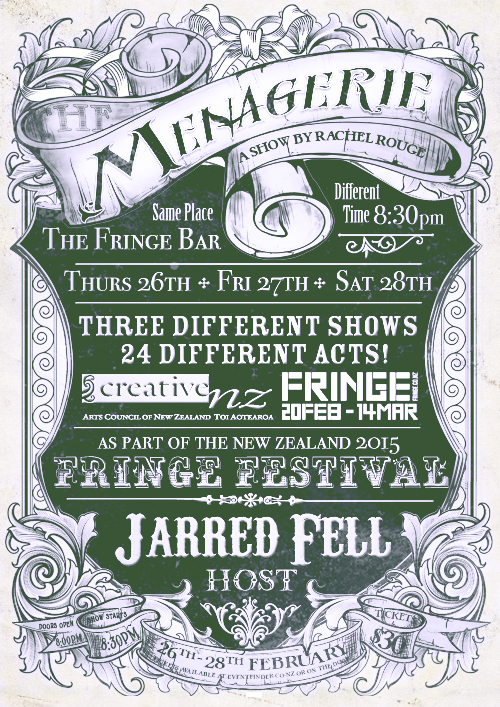 Wellington’s monthly variety show The Menagerie will offer a special three-night smorgasbord of live performance. A sample box of tasty treats and all the best bits of the New Zealand Fringe Festival, mixed in with The Menagerie’s usual assortment of poetry, burlesque, stand-up, music, and weirdness. Each night 8 different spots are filled with talented performers showing off the sweetest and most delicious cuts of their talent. It’s one of the best ways to taste-test many of the shows on offer during the Festival. Every night from the 26th to the 28th of February will feature a totally different line up hosted by award winning Auckland comic and magician Jarred Fell. Included in the succulent tapas will be songs from 28 days: A Period Piece, UV Puppetry from Haste Away Home, Stand up from Jerome Chandrahausen and Jonny Potts, Physical comedy from Sarah Tuck and loads more. So if you just want a nibble, a sip, or a bite of the Fringe Festival, come down to The Fringe Bar at 8:30pm on the last Thursday, Friday and Saturday of this month to relish the flavours and satiate your appetite without having to commit to a full meal. 3 shows at 8:30pm at The Fringe bar, Wellington, Thursday the 26th, Friday the 27th and Saturday the 28th of February.